Gratitude has become one of the most commonly recommended forms of self care and while I, like many others, have heard about gratitude journals, gratitude stones, and daily gratitude practices for years, I didn’t really believe it would work until I experienced it for myself. In theory, the idea of staying grateful for what we have sounds fantastic but there were many moments when all I could see was the lack. The unfinished projects, the unfulfilled dreams, the problems. I would look around and feel like a failure because of what hadn’t been done. It was exhausting. I poured so much of my energy into being unhappy with what I didn’t have, that I was wasting the amazingness of what I did have. I started my gratitude journal out of desperation. It had come up in my life so often that I couldn’t help but take notice, so when I was sick and tired of feeling like I couldn’t catch up, or measure up, I tried it. After all, I didn’t have anything to lose and there was definitely a lot to be gained. I didn’t understand what exactly I was doing at the time but as my understanding grew, I began to see how living from this perspective was soulful and spiritual. It gave new meaning to everything around me. Now, years later, gratitude is a force we’re all beginning to understand as a prayer based emotion that creates a faithfulness within our intentions and desires. It is an inner certainty, not only of how we want our lives to unfold, but also of how it is good and right that they should unfold in a way that we intuitively feel is Truth. This is a part of spiritual consciousness that has been spoken about for centuries and now it is becoming a part of our daily lives. There is a new awareness about spirituality where we are waking up to the fact that life is much more than the secular, the material, the social. We are becoming aware of the deep spirituality within us and around us. Each of us is finding our own path to this awakening, through different avenues. When we find these paths, they light us up. They give us a new found joy and even more to be grateful for. We open ourselves up to possibility, rather than shut down in misery. We are designed to spiritually awaken, to feel that there is a spiritual basis to our lives. We intuitively know that we are here with a purpose and a mission. If we stay aware of the synchronicities around us, they lead us and help us on our individual journeys. We’ve all experienced coincidences that seem too good to be true. Yet they aren’t. These sometimes almost magical opportunities are part of the spiritual synchronistic flow that is our birthright. And we can tap into this power. We can learn, through practices like gratitude, to use this gift in a far greater way. The force of our intense expectation, and our faithfulness that the things we yearn for will happen, will give us a certainty that is genuine and authentic. Gratitude is not only a feeling to dive into after something special occurs, it is the prayer of what is yet to come, seen through our imaginations as a clear picture of our lives. With heartfelt intention and real gratitude, felt down to the level of the soul, as if the prayer had already occurred, we can confidently know that we are able to manifest and create the circumstances in our lives. And as a result, our dreams arrive faster, our destinies unfold, and our lives are filled with joyful synchronicities and amazing outcomes. Whether we choose to do our gratitude practices in the morning or the evening, in a journal, or holding a stone, it doesn’t matter. The external practice isn’t nearly as important as what we put into it. There is no right way to be grateful, as long as each of us does what resonates for us individually. Going through the motions of gratitude isn’t enough. 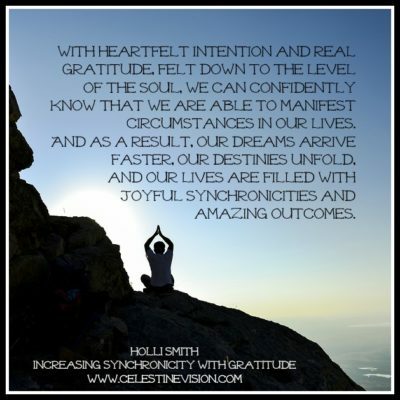 It is our intention, our belief, and the depth of feeling stirred within us that will become the driving force behind using gratitude to enhance our wellbeing and the impact of synchronistic flow in our lives.